The resort is currently at 96 percent of its average snowpack compared to the 30-year average, according to opensnow.com, and confirmed by the resort. And they’re trying to spread the word. The snowpack is creeping back up to normal levels, even as snowfall continues to lag behind. 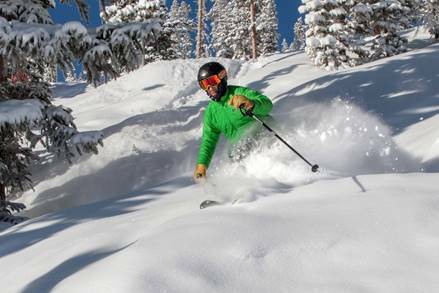 The resort has gotten about 175 inches of snow this season, about 87 percent of the year-to-date average of just above 200 inches by mid-February. The resort averages about 322 inches per season; a mark Hurlbert is confidant the resort will at least approach. Over the last ten years the resort has surpassed the 322 mark six times, and Hurlbert said the resort has seen only one season of less than 250 inches in the last 20 years. The 2011/12 season saw only about 190 inches due to a remarkably dry springin March and April, when the resort often sees it’s biggest snowfall numbers. There are lots of possible explanations as to why Winter Park Resort has been able to withstand an otherwise miserable winter for other areas. The first is the location, nestled right in the middle of the continental divide. Another consideration is the temperature. Comparing average high and low temperatures for Winter Park Resort over the last decade with average high and low temperatures this season shows that there’s been much more fluctuation than usual. The discrepancy is easiest to see in the months of December and January. The area typically averages a high of 20 degrees Fahrenheit and a low of seven degrees during those months. This season the average highs were 24 and 29 degrees, and lows were -2 and -3 degrees respectively, according to Weather Underground. The larger range of temperatures may help explain why the resort can maintain 96 percent of snowpack with only 87 percent of average snowfall. Certainly a healthy February has helped set the resort up to finish out the season strong. So far this month the resort has gotten more than 43 inches of snowfall, and is on pace to outperform ten year averages of 54 for the month. February is also the first month since October, 2017 where both the season’s high and low temperatures dropped below the ten year averages.